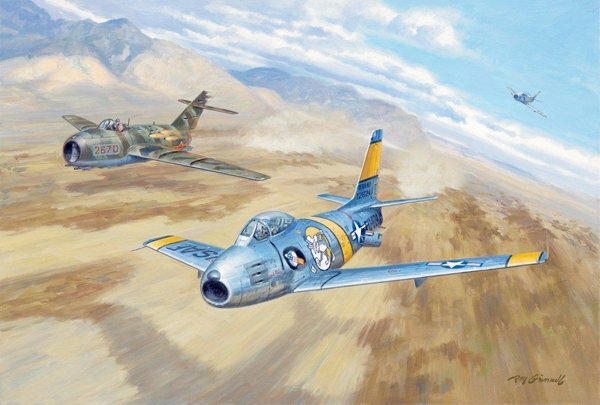 Major Robinson Risner from the 336 FIS flying an F-86E was escorting some fighter-bombers near Sinuiju, Korea. Risner's flight met 4 MiG-15's head on. Combat ensued and MiG's started to run. Risner fired a short burst at the tail-end Charlie. Risner's ammo hit the MiG's canopy and it shattered away. The MiG and Risner descended to ground level, right on the deck. The MiG threw out his speed brakes. Now they were wing tip to wing tip. Risner looked right at the pilot as they flashed over the river bed. Risner's wingman yelled "hit him," "get him." The MiG pilot looked over at Risner and shook his fist, his oxygen mask was torn off when the canopy was shot away. The MiG pilot led Risner right onto the Tak Tung Kau airfield 35 miles inside China and was hoping that Risner would be shot down at the air field. Risner got the damaged MiG and it disintegrated everywhere as it hit the ground at the air field. This was Risner's 7th victory. Major Risner ended his tour in Korea with 8 victories.